For those who may not have seen them, I had two letters to the editor (LOEs) published recently, one on Tucson.com and the other in the Arizona Republic. As you might have guessed, they were about education. I don’t know that these LOEs moved the needle any, but if enough of us write them, they surely can begin to. Certainly, we are seeing much more in the news about education than ever before. 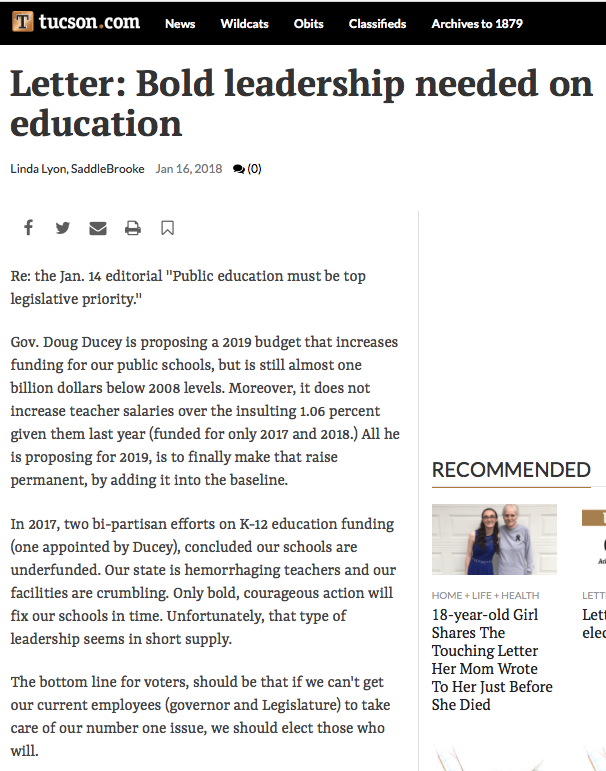 I believe (probably in attempt to be fair and balanced), that they are off-track when they write that Ducey’s add of $4 million for early literacy is “worthwhile and commendable.” I say this because they seem to equate the value of early literacy efforts with that of full-day kindergarten, when they give Ducey kudos for proposing 1.6% of the funding needed for early childhood education, versus providing the necessary $240 million for full-day kindergarten. Is it really too much to ask for our state to ensure all our students are given a good start on their educational journey? After all, our state lawmakers give away over $12 billion each year in corporate sales tax relief, on an annual budget of less than $10 billion. Are you really telling me we can’t find 2% of that corporate welfare that not producing a good return on investment and redirect that money to fund full-day kindergarten? And oh by the way, many districts are already paying for full-day kindergarten out of existing funding which ultimately, shortchanges what can be offered other students. But, governing boards across the state have made this decision because they recognize how important kindergarten is to promoting successful outcomes for the rest of their students’ educational experience. That’s my real beef with this “Education Governor.” Arizona’s district schools are in a huge funding pit dug over several years – even with his proposed increase for 2019, the funding is still almost $1 billion short from 2008 levels. The restoration of those funds cannot be, dripped back into the pit. We need an “open the flood gates, turn up the pump” solution to getting our schools the support they desperately need. We are hemorrhaging teachers (2,000 positions vacant and another 3,400 filled with non-certified personnel), and with as many as 25% of our teachers eligible to retire in 2020, this problem isn’t going to get better anytime soon. Neither with our districts provided only 15% of what is required for maintenance and repair, can our deteriorating facilities continue to be nursed into service without more failures rearing up to bite us. What our district schools need, and our children deserve, is bold courageous leadership NOW. 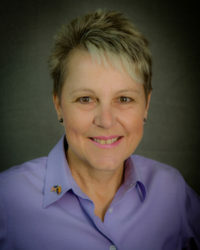 The time, as AZ Senate Minority Leader Katie Hobbs recently stated, “We’ve got all the change from the couch cushions that there is.” We need a real infusion of revenue now, before we fail another generation of students.